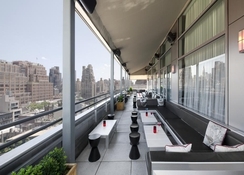 At the Gansevoort Meatpacking NYC, you will find yourself in a fantastic area of ​​New York (Greenwich Village) and you reach in less than 15 minutes by car from several of New York’s high end boutiques and great food joints! The Gaansevort Hotel in New York’s Meatpacking District is just one block from the High Line Park. The surrounding area of the hotel is famous for its high density of celebrities. As hotel guests you can sit here at the edge of the rooftop pool and let your eyes wander over the rooftops of the city. From the hotel’s deck, you can enjoy beautiful sunsets over the Hudson River, which also gives the hotel a reputation of having the best views in and off the city. This 4.5-star hotel is only 2.7km from the Empire State Building and 3.2 km from New York Public Library. 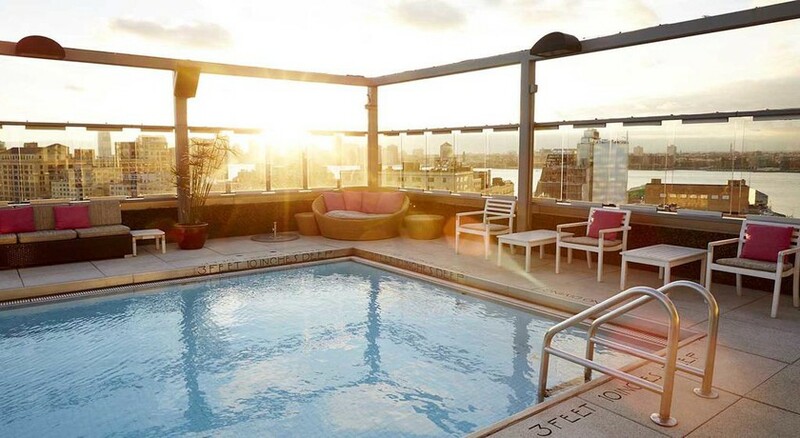 Gansevoort Meatpacking NYC is conveniently located 5km to the City Centre and 20km from the LaGuardia Airport. From the JFK International Airport, the hotel is about 45km. Enjoy a 10-minute walk to the nearest metro station (14th street) and 2km to the nearest fair site (Jacob K. Javits). 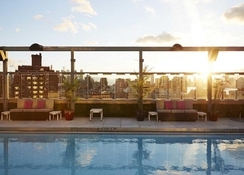 Gansevoort Meatpacking NYC welcomes guests to its 187 rooms. The air-conditioned establishment welcomes guests into a lobby with 24-hour reception and 24-hour check-in / out service. Individual floors are easily accessible by elevator or by stairs. Facilities include a cloakroom and a safe. Wi-Fi in public areas allows travellers to stay in touch with the online as well as the outside world. 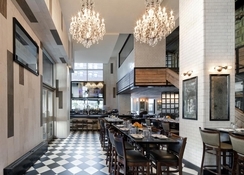 There are various dining options to choose from at the Meatpacking District Restaurant and the Meatpacking District Rooftop Bar. Guests can enjoy various cuisines from around the world in the French-inspired décor restaurant. All three main meals convince with diverse food offerings. Pleasantly heated water in the indoor and outdoor pools ensures a relaxing experience. In addition to a gym, billiards, a spa, a steam room and a beauty salon, the hotel also offers massage treatments for a fee. Additional amenities include an activity filled entertainment program for children.